A personalized memory candle is a great way to remember people who are not present at an important event in your life, such as your wedding. What is a Memory Candle? A memory candle is any candle that holds a special memory for you. These candles are usually engraved or printed with names, dates, poems or pictures that help you remember an important person in your life. They're typically used as part of the wedding ceremony, either as the unity candle or as a candle that is kept on the altar during the ceremony. The candles are used to symbolize a person who has died, such as a parent, grandparent or other special person in your life who you wish could be involved in your ceremony and who you believe is there with you in spirit. Memory candles are usually white or off-white with black, gold or colored text. Pictures or other graphics can also be printed on the candle. The more text or graphics you put on the candle, however, the more expensive it will be. Before you go shopping for a personalized memory candle for your wedding or other special event, you'll want to think about the person or people you are memorializing. If there are several people you want to honor on your candle, simply listing the names would be appropriate. If you're honoring just one person or a married couple, you'll have more room for pictures, poems, or other text describing how you wish that person could be with you on this day. The companies that provide these sorts of candles can offer sample text to get you started, or you may want to think about a favorite quote of the person's or a poem that he or she loved. Some companies have several samples that you can choose from or a general verse about knowing the person is looking down on you on your special day. You can also just keep it simple with a "In Loving Memory" and the name and dates of birth and death, along with a cross, a dove or some other symbol of your religion. 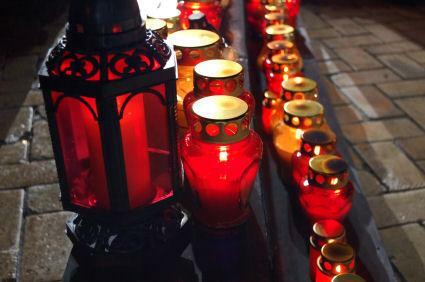 Typically, candles must be ordered up to a month in advance since they are made after they are ordered. In some cases, rush items may be available for an extra fee. Memory candles do not need to just be used at weddings to honor someone who is dead or not able to be at the event. They can also be used to celebrate a new birth or even as a way or remembering someone who has recently passed at a memorial service or holiday event that is some time after the funeral. A memory candle is basically just a custom-printed candle that can have any graphics or text you want on it. Consider a candle printed with a wedding picture for an anniversary party or a candle with baby's first picture on it for his or her 16th birthday or to light at the christening. Memory candles do not have to commemorate sad events, and can even be used as holiday gifts that will remind people of a great time you had together as a family or a fun outing with the girlfriends. Memory candles are a great way to remember the special moments of your life.